The World of Wargaming to players of Warhammer 40,000 is a very chaotic one. Tough soldiers of the Empire take to the battlefield in the form of Space Marines and Imperial Guard, Aliens like the Tau operate their long range weapons to slay the rugged and berserk forces of the Orks. Players of all walks of life paint armies of beautifully painted miniatures, most not measuring more than 3 Centimeters high. Now the status quo for Warhammer 40,000 players will soon change, with the release of Codex: Daemonhunters 40k players will now be exposed to the best the empire has to offer, and let me tell you: They're Mean. The Codex itself consists of sixty two pages of historical stories, character stats, force charts, and hundreds of notes and quotes that tie the Daemonhunters in with the rest of the Warhammer 40,000 Universe. As an army addition to Warhammer 40,000 the Daemonhunters present you with a few choices right off the bat, which I really enjoyed as I like to tweak my army selection from game to game. You have the option of adding Daemonhunter Inquisitors and their retinue to existing Imperial Armies, building a force of Daemonhunters with added Imperial Support, or making an entire Daemonhunter army using only the forces listed in the Codex. My first experience with the Daemonhunters came by combining an Ultramarines force, with a squad of Grey Knights and a Squad of Grey Knights Terminators. Not only are the Terminators simply sick when applied to the battlefield, but all Grey Knights have the option to Deep Strike which allows them to deploy after the first turn anywhere they choose on the battlefield. Codex: Daemonhunters also brings to light the legendary stories of the Inquisitors in their quest to remove the elements of Chaos and destroy any daemon influences throughout known space. An Inquisitor in it's own right is the best the empire has to offer, given freedoms the average Imperial Squad wouldn't be able to utilize, thus allowing the Inquisitor and his force to effectively stop any Daemon threat before it spreads and infects other worlds. So with a license to kill just one small part of an Inquisitor's force, the stories of their feats are simply good reading. The Force itself is an amazing addition to the Warhammer 40,000 range. Having your choice of an Inquisitor with a retinue of augmented henchmen that assist in their masters goals, as well as a choice between Grey Knight forces, or Daemonhosts; Human subjects with a Daemon entity harnessed through the Warp and used as living weapons, able to channel warp energies and inflict damage against their daemonic brethren. If you decide to go with Grey Knights in your army you'll be gifted with a long list of armaments and weapons that come standard not to mention upgrade options that will make any player very happy. 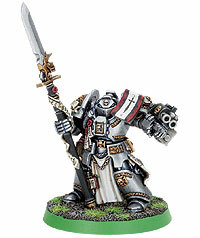 While a bit more expensive than the average Space Marine, most Grey Knights are powerful psykers and can utilize their enhanced technology and their psychic abilities to neutralize any threat to the Empire. Overall Codex: Daemonhunters is a book that any fan of Warhammer 40,000 should pick up, even if you don't intend to actually play a Daemonhunters army. The information and stats in this book is not only a good source of intel on what other players will soon be bringing to your local store, but also a good source of background information on how the influences of Chaos are infecting the Universe. Definitely a welcome addition to my Codex Library. Codex: Daemonhunters is available for $20 US and it, and the entire line of Daemonhunters Models, can be found at your local Games Workshop store, or anywhere Games Workshop products are sold. Are you a fan of Games Workshop's Warhammer 40,000? Want to tell us about your experiences with the game? Drop us an e-mail to Havens@TheOneRing.net and share your stories with us today!